Brushing and flossing with braces is essential to maintain your oral health. Brushing helps remove most food and plaque from your teeth, while flossing removes the food particles a toothbrush can’t reach. When you brush and floss regularly, you are making huge strides toward preventing cavities, gum disease, gingivitis, and bad breath. Brushing helps remove most food and plaque from your teeth, while flossing removes the food particles a toothbrush can’t reach. When you brush and floss regularly, you are making huge strides toward preventing cavities, gum disease, gingivitis, and bad breath. Although many people brush their teeth immediately after eating, it’s better to wait. After eating, your teeth are exposed to acidic food and this can soften the enamel. Brushing immediately after a meal may increase the risk of enamel erosion. So, it’s best to wait at least 60 minutes after eating to brush your teeth. Hold your soft-bristled toothbrush at a slight angle and use short back-and-forth motions. Avoid harsh scrubbing, since this will irritate your gums. Start by brushing the outer surfaces of both your upper and lower teeth. Then brush the inner surfaces of upper and lower teeth as well. Next, brush the entire chewing surface of each tooth to remove excess food particles. Finally, gently brush the tongue to rid it of food particles and airborne bacteria and to prevent bad breath. Finish by using an antimicrobial mouthwash or mouth rinse to freshen your breath and prevent gingivitis and gum disease. Ideal oral hygiene would mean flossing after every meal, but you should floss at least once a day. With practice, flossing will only add a single minute to your oral hygiene routine. The best time of day to floss is before bed since this will remove any remaining food particles from the day and prevent bacteria from spreading through your mouth overnight. Both waxed and unwaxed floss effectively remove plaque from your teeth, so you may use either one. Many people find that waxed floss slides more easily between teeth and is less likely to shred while flossing. Start with an 18-inch piece of floss, long enough to allow you to wrap it around your fingers and still easily maneuver around your back molars. 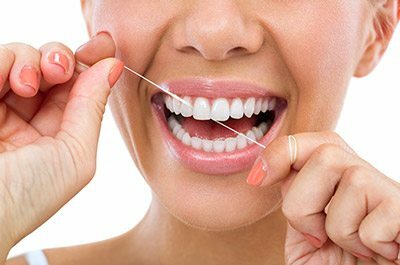 Hold floss tightly and gently slide it in an up-and-down motion between each pair of teeth. Be sure to scrape away any obvious food particles and loose plaque. Curve floss in a C-shape around the base of each tooth to remove any food particles caught beneath the gum line. Never snap or force the floss, since this might cut or bruise your gum. For more tips about brushing and flossing with braces, visit the Cardinal Orthodontics blog.